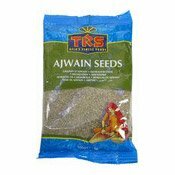 TRS Ajwain seeds are used extensively in Indian cooking. Ajwain has a flavour similar to thyme but is stronger and less subtle. Complements breads and parathas and goes well with vegetable and potato dishes. Ingredients: Lovage Seed (Ajwain Seed). Simply enter your details below and we will send you an e-mail when “Lovage Seed (Ajwain Seed) (當歸子)” is back in stock!